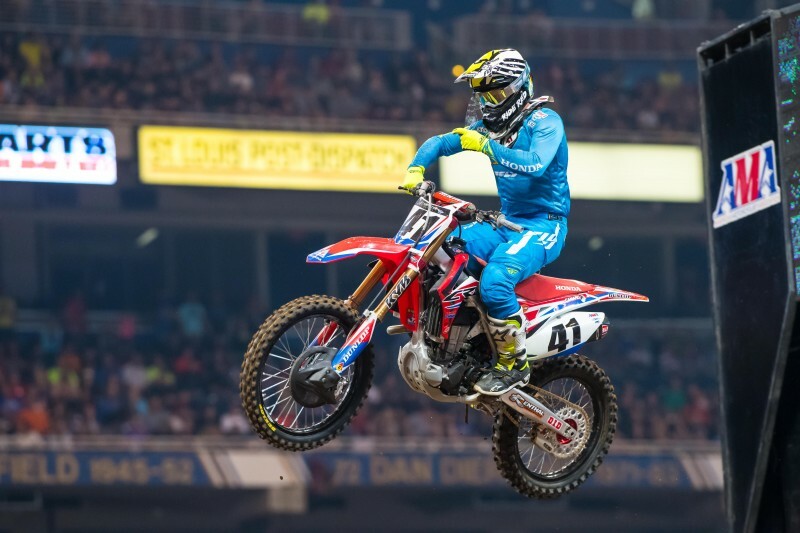 With a series of earthquakes having just struck Japan’s Kumamoto area, Team Honda HRC attended the St. Louis Supercross with their thoughts on friends and family, as well as everyone affected by the disaster. 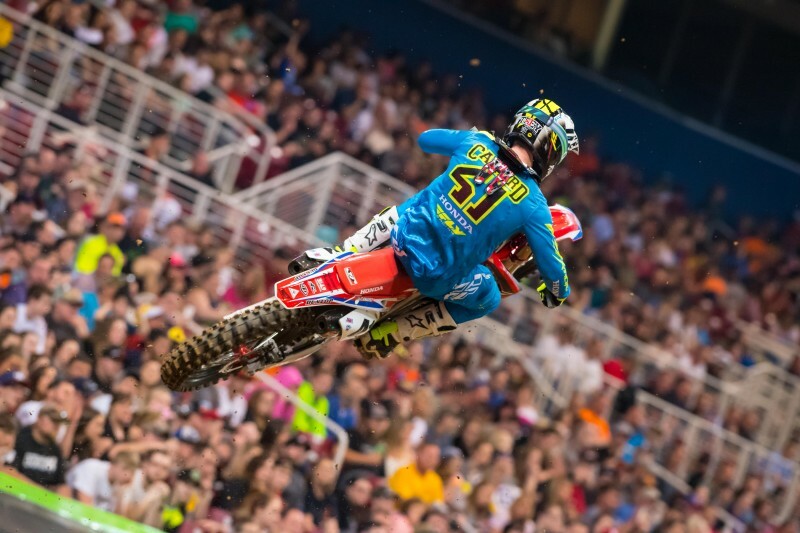 Trey Canard fought through the pack to a fifth-place finish in the race. Off the start, the Oklahoman got hung up with another rider, causing him to fall back to nearly last, but he wasted no time in working his way through the field, advancing to 12th place by lap four. 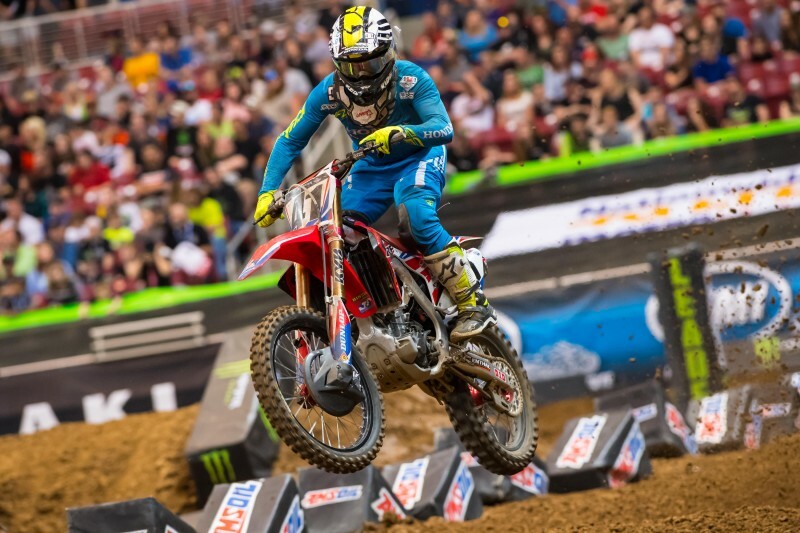 While running lap times equivalent to the leaders, Canard continued his impressive come-from-behind performance, ultimately rounding out the top five as he took the checkered flag. 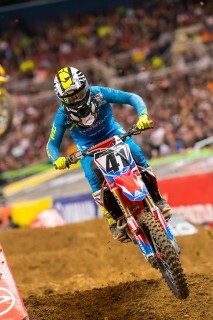 GEICO Honda’s Justin Bogle also turned in a solid ride, scoring a career-best fourth-place finish. 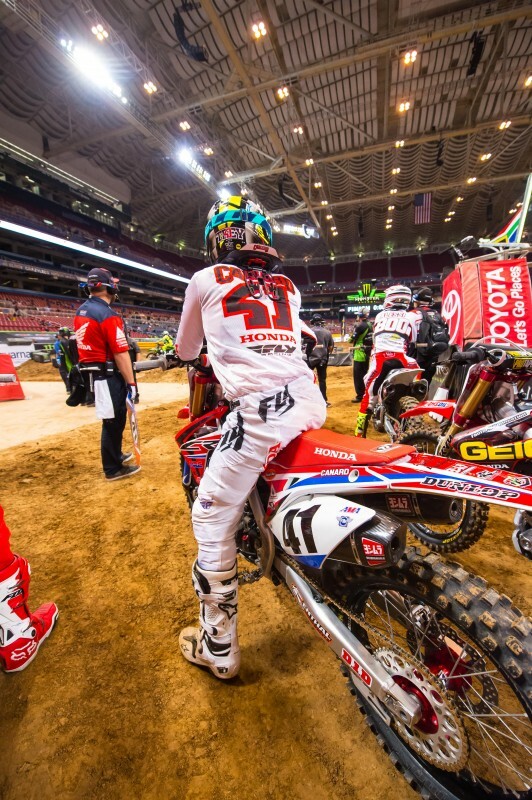 Prior to Saturday’s action, Team Honda HRC’s Trey Canard joined GEICO Honda’s Justin Bogle, RJ Hampshire and Malcolm Stewart for an appearance at Big St. Charles Motorsports to hang out with fans and sign autographs at the dealership’s annual supercross party. During Saturday’s timed qualifying sessions, Canard notched the second-quickest time with a 53.868-second lap. He was one of only three riders to dip into the 53-second mark. Bogle was tenth at 55.120. 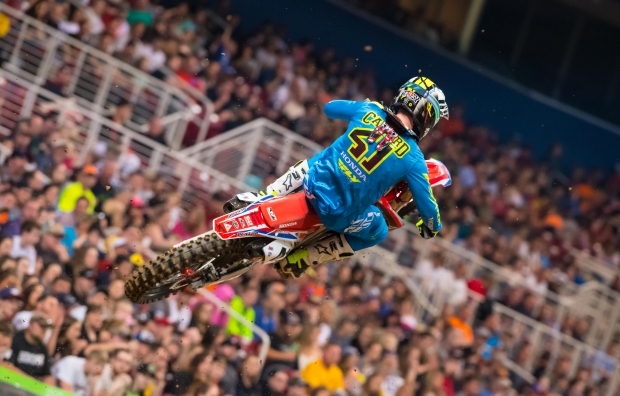 Slotted in 450SX heat 1, Canard launched his CRF450R race machine to a sixth-place start. With only four transfer spots available, he quickly began battling his way forward, advancing to second by the checkered flag. Bogle was in the same race, but had his work cut out for him after starting outside the top 10. He would eventually qualify to the main event via semi 1. For the sixth time, Team Honda HRC hosted a family through Ride for Kids. The family’s son Josh is a brain-tumor survivor and has participated in multiple Ride for Kids events in the St. Louis area. 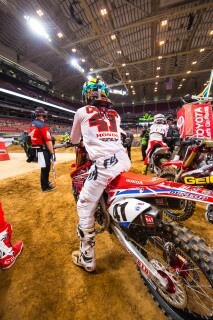 The family received tickets, a rig tour and got to meet Canard before joining the team for dinner. The Honda Red Riders will return to action on April 23 for the inaugural Foxborough Supercross in Massachusetts. Members of Team Honda HRC were keenly aware of the Kumamoto earthquakes, as the CRF450R motorcycles that the squad races are produced at Honda’s Kumamoto factory in Ozu, about 150 miles east of the 6.2 magnitude April 14 foreshock’s Mount Kinpu epicenter, and 130 miles east of the 7.0 magnitude April 16 mainshock’s Higashi Ward epicenter. Many of the team’s Japanese staff travel regularly to the plant, which also houses R&D operations, and many associates who work on the CRF models live in the area. The quakes were Japan’s largest since the 2011 tsunami disaster, and damage to Kumamoto prefecture, on the island of Kyushu, was extensive, with dozens perishing. Supply chains were damaged as well, prompting Honda Motor Co. to suspend operations at the Kumamoto plant. The factory was scheduled to reopen on April 22, with subsequent production plans to be determined according to facility restorations and component supply. On Monday, Honda released a statement saying that it would like to express its deepest sympathy and condolences to the victims of the Kumamoto earthquake. The company wishes residents of Kyushu the soonest recovery, and will put all of its efforts into it. I really enjoyed the track all day today. I felt comfortable and we made some good adjustments right away, so everything was clicking. I felt strong all day, but again, my starts were not on par, which really cost me. I definitely think I could’ve been on the podium and battling with those guys up front, but you can’t do that from last place. I had an okay jump but got stopped when another rider in front of me went down and I had to go around him. Definitely not the way I wanted to start it, but I’m happy with how I rode. We have three more, so hopefully I can finish strong.